Double click on pfit.exe to load the program. A black window will open to load the program. This may take a few minutes. Use the open file button to select the desired .xy file. The filename of the currently open file will be displayed underneath this button. Files in the same folder can be opened by changing the filename and pressing enter. PowDLL can be used to convert files to .xy format. Select the desired peak type to display the parameters for that function. Enter the range of the desired fit and a rough estimate for its centre. 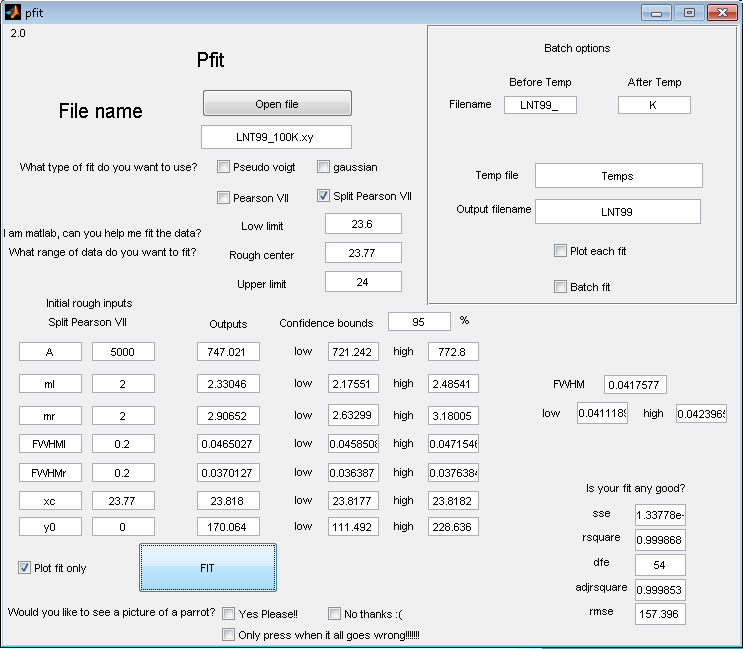 Enter initial values for the parameters of the peak shape and click fit. The fit parameters are displayed with confidence bounds. Copy the part of the filename before the temperature and paste into the box. Do the same with the text after the temperature (the .xy is needed). Create an excel (2007) document that has a column containing the temperatures of the scans. Place this in the same folder as the data. Put the filename in the box and add a name for the output file. To start the batch fitting put a tick in the batch fit box. Peaks can be fitted with a range of functions. 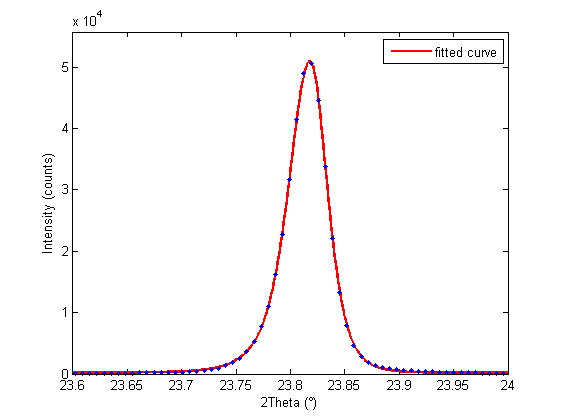 Problems with Gaussian peak fitting fixed. Matlab files can be used for the input. When using a batch fit the .xy needs to be included in the filename.